Miles Aldridge, fashion photographer and artist, on his copy of The Garrick Year by Margaret Drabble. 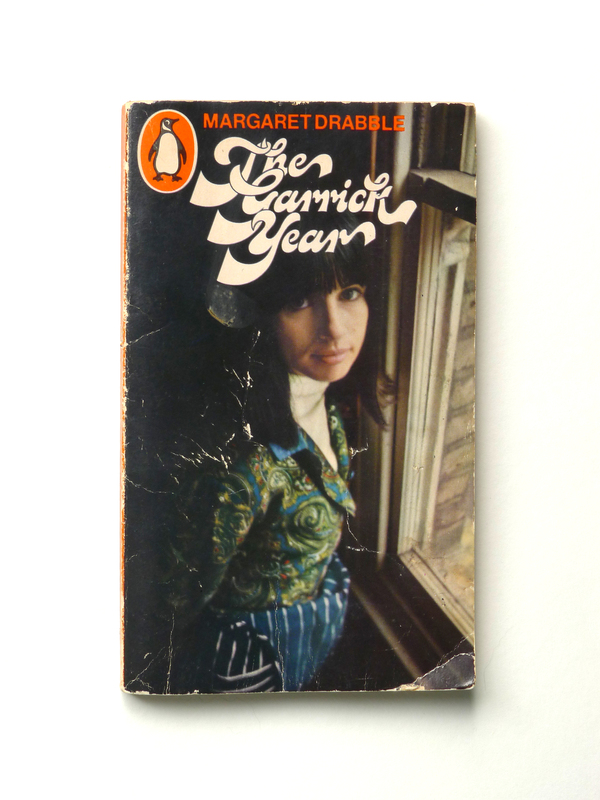 MA This is a copy of ‘The Garrick Year’ by Margaret Drabble. It’s one of many paperback books my father created the cover for during his tenure as art-director of Penguin Books between 1965 and 67. I’ve grown up with these books. As a child I remember them piled up in my father’s studio while I’d sit on his lap, inhaling the smoke from his cigar, watching him draw. When he was at Penguin there was this colour-coding scheme for the spines of the books with orange for Fiction, green for Crime, blue for Classics and black for Science-Fiction. So across his bookshelf and stacked up on the floor I remember these kaleidoscopic towers of literature – and as I turned from a child into a young man these books remained a curiosity to me because if you could be bothered to open them you might find something remarkable like the opening sentence to Franz Kafka’s ‘Metamorphosis’ or a description of the conquest of the Aztecs. However I chose this one as an object rather than a book because I have to confess, I’ve never read one word of it. Looking inside it states it was published in 1966, which is when I was 2 years old. Strangely it also states it is Penguin number 2549 which has a sinister feel to it like a prisoner’s number. On the cover is a photograph of my mother taken by my father at the family home. I know that my father took this picture with a Nikon F, which was the camera that he then passed on to me when I became interested in photography as a teenager. He wasn’t a professional photographer, he was an art-director who then became an illustrator in the 1970s. Like a lot of people from swinging London, after the psychedelic late 60’s he moved to the countryside where he lived a bucolic life of cloudy beer and lazy days. There in a Georgian rectory he drew Hieronymus Bosch-like images of giant insects waltzing and dinning at a Victorian banquet, all meticulously airbrushed in Pop-Art colours. GB Tell me about your mother as well because it’s a picture of her. MA She was a very young and beautiful mother as can be seen on the cover. The synopsis on the back of the book states that the story is about infidelity and divorce, which is incredibly ironic and poignant. Five years after posing with this impenetrable Mona Lisa smile and an apron as the beautiful housewife for a novel about fictional infidelities her own wrecking-ball of a divorce would smash her and her home to pieces. So this old dusty and battered book is a souvenir from my childhood and works almost like a ‘memento mori’ reminding me about the transience of all things; this marriage, these children, this house, these people can all just vanish overnight. My father’s still alive but my mother died very young, at forty-nine. She never recovered from the shock of the losing everything and my sister and I had to watch her hide her sense of failure behind a mask of beauty. But the chasm was too deep for her to climb out of and that endless sadness turned into cancer and then she died. The end of the marriage had left her with a lack of self-esteem and emptiness. For me, as an artist, the wounded mother figure who wears a mask to conceal her wounds is an archetype in my work. Like my mother on this book cover, staring blankly out of the frame she is not just a Stepford-Wife, but a complex woman, who through some kind of shock has outwardly turned to stone. That’s the way I remember my mother and I feel that it’s often the case: there is a child, the child has their dreams, they grow up into a person and suddenly the dreams aren’t there any more and the face forms a mask to hide the disappointment. That was certainly my mother’s story. I think that’s why my work resonates with so many people. It’s not fashion photography. They see through the veneer of the beauty and the style and all this rather faddish stuff, to humans who are questioning their lives. Like my mother on this cover, having attained the home and the husband, it can vanish in an instant. Marriages don’t always fall apart but this happens to be the experience of my childhood. So here is my mother frozen in time as a young woman awaiting the promise of a happy marriage and not ravaged by cancer. I still feel incredibly connected to the child I was of seven or eight years old, holding this book in my hands and realising for the first time that it’s my mum on the cover. Also, one of the first things I felt when I saw my father’s book covers was a realization that this is how you can live as an artist; you create a picture, put it on a book cover and you’ll get paid. Back in the 1960’s when my father was an artist most people were much squarer and came to pick up their children from school in pin-stripe suits. The differences between the cool people and the very square people were really profound. My father would dress in a very flamboyant, psychedelic way. He had long hair, which he dyed platinum blonde and fashioned into a slightly weird comb-over because he’d started to go bald quite young. He wore these incredible flared orange tweed suits over shirts covered in hand-embroidered butterflies with a jewelled dragonfly broach. He was a rockstar father: I wanted to be like him when I grew up. Long before I’d been given any career advice at grammar school, I had made the calculation in my head that if I could design thirty or forty book covers a year like my dad I would make £100 per book cover. And so when I went to art-school I became an illustrator just like my father. At art-school, surrounded by new influences I began to question my father’s aesthetic. By that time he was in Los Angeles and he had left me all his books. GB You’ve said in the past that you use beauty in your work so you can pull people in and then unsettle them somehow. Are you trying to give people a warning? That they can be surrounded by beauty but it hides this darkness? MA Yes I think so. I don’t know if it’s a warning or just a fact. That is what I’m trying to convey because it’s something that I’ve seen through my mother and my sister. My sister surprised me by becoming a model when she was fourteen. We had that kind of relationship where we literally fought every day. There must have been something in our astrological charts that meant we were like oil and water. Now, we get on very well but when she became a model I couldn’t believe that this was possible. I didn’t see her as beautiful at all, I saw her as this monster that always pissed me off. Then I’d visit her on Bruce Weber shoots as her career exploded and I saw her transformed like the Pygmalion story into a lady. She was, I believe, the first model to be given a Ralph Lauren contract, which meant that she was paid a huge amount of money to do a very small amount of modeling and legally forbidden to do any other work. It was a really bizarre time for her. She was in her teens and she had to just sit around waiting for the next ad campaign in the next exotic location. So my sister presented me with this contrary image of a woman seemingly with everything but actually with nothing. Success and discontent simultaneously. GB So that’s where you get this feeling of emptiness in your pictures? MA The nicest way I can say it is that I’ve been married to, been the son of and the brother of three very beautiful women all of whom, just like many human beings, were complex, broken and flawed but coupled with beauty these secret wounds and scars seem more shocking. I believe in beauty and naively imagine that it should equate with happiness but it doesn’t. This idea was really brought home to me by the contrast between my shell-shocked post-divorce mother and the women I saw in her copies of Cosmopolitan where everyone was so bizarrely happy, excited and jumping for joy. I‘ve read that Richard Avedon had a beautiful sister who was locked away in a mental institution in her twenties. I sometimes wonder if this flawed beauty in his family closet was what drove his obsession with women and beauty. GB Do you think that being surrounded by beauty is a consolation? Can it make you feel better? MA Beautiful things or beautiful people? GB I’d like to know how you feel about both. MA I do think that beautiful things have a wonderful psychic energy. If you think that you can create the same art in a kind of fluorescent-lit windowless bunker as you can in a space where you feel very comfortable with some objects that are touchstones to things in your life, I think you’re wrong. I definitely need to have things of beauty around me. But people that are beautiful are far more tricky. A person who looks beautiful but is actually riddled with anxiety is not a beautiful thing. This is the contrast and the conflict that my work is really about. It’s wonderful for me being in the pages of Vogue Italia, in a way, passing comment on the fact that these objects, these things, even these hair-colours and lipsticks won’t bring you the happiness the advert on the next page proposes that they will. GB I suppose being beautiful can only get you so far. MA I know a lot of young beautiful girls and mostly that beauty means that they end up with some awful man. Beautiful people don’t always end up with beautiful people. GB Are you influenced by classical art? MA I am. I’m constantly on the lookout for old books with reproductions of Renaissance paintings. I seem to buy several a day at the moment. It’s a strange addiction and a new hero of mine is Kenneth Clark who was the director of The National Gallery through the 1930’s and 40’s. In these days of huge art fairs and super-galleries and auction houses that look like car-showrooms servicing a lot of rich people with wall space to fill, all the pomposity of the art world just seems to turn to dust when reading Kenneth Clark’s sharp and precise thoughts on Art. This is a man who loved and felt deeply about art and the message he shares again and again is always about a love of the beautiful and human in Art. I saw the recent Tate Britain exhibition on his personal art collection and then re-watched his famous television series ‘Civilization’ on repeat. The stories he recounts throughout the centuries of image making are peppered with truths we recognize as human behavior and I’d like to hope that’s what’s happening in my work too. I try to bring the grandeur and humanity that I find in Renaissance paintings to my work. Quite often it happens that I’ll be talking to journalists or collectors about my work and they’ll make this wonderful Freudian slip and refer to my photographs as paintings. I still shoot on film, which means I operate in an ‘old-school’ way to convert what’s in front of the lens into pure colour, which is much closer to painting than a digital capture of an image. Digital photography will never have that shock of colour. It’s just too flat. I always get a thrill opening my Kodak box of contact sheets, seeing what I’d only seen as a Polaroid now as pure chemical colour. GB It is always possible to recognize your pictures from the colours in them. MA It is remarkable to me that given how much visual garbage there is in the world that my pictures are somehow able to hold there own against this flood of images and I am sure this is a lot to do with my use of colour. Billboards full of stupid pictures make me fume because in my mind the world should be full of fabulous imagery. It’s a shame that beauty is so often sidelined in today’s magazines, film-posters and adverts. MA I might have to pretend for a moment that I have my hair combed back with thick Brylcreem, rather bad dentistry and am wearing a 1940’s Harris Tweed suit. I’m now Kenneth Clark… and so can talk in perfect BBC RP about what he described as being… “transported by Art”. I think beauty in Art is a transporting quality that momentarily stops time and then returns you to the world more alive and sensitized to the sensations there. The women in my pictures seem to have stopped time in the way that they’re frozen in a moment of deep thought. Marilyn Manson wrote something about how the blankness of the figures in my photographs allow the viewer to enter their heads and see the world through their eyes. My work is something I take very seriously. It’s a deep meditation and a desire to tell my story. It’s an instinctive search for beauty and the strangeness behind the beauty and not as facile as ‘this image’ equals ‘this feeling’. GB I love the way that people like you and David Hockney are so shamelessly into beauty. MA My mother gave me David Hockney’s book on his early work [goes to find it]… Inscribed inside it says, “For Miles who may one day be just as successful, much love, mum.” That was Christmas 1988.